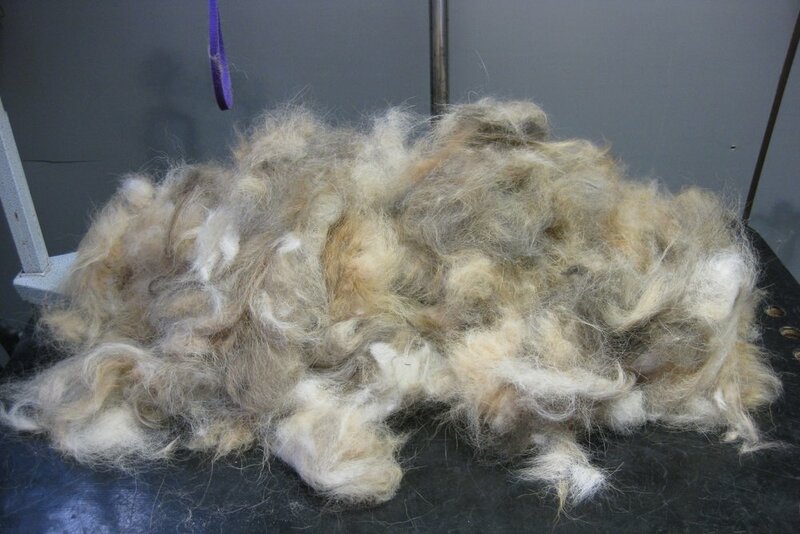 I know these photos are hard to look at, but it’s a part of a groomer’s daily life. It happens in rich places, and poor places. It happens to the best of us. We all lead busy lives. Sometimes it seems our pets are the only people who don’t complain, even when they are in dire need of attention. Food and water are essential to life, but what else can we offer besides companionship and exercise? Regular attention to how our furry friends behave can clue you into what they’re feeling, and more importantly howthey’re feeling. An itch here, a shake of the head there…these are the signs we all need to pay attention to. A regular check of the ears, eyes, feet and coat can be done when just petting them. Please, if you care about your pet, invest in the appropriate brush for the breed! Develop a relationship with a good groomer and a veterinarian, and start them early! Though your dog may not look like this, and I admit it’s an extreme example, matts are insidious. They are not always visible. Below are some examples, and no, the owners had no idea how bad the situations were. A smooth outer coat can hide a very tangled undercoat. Here you see the before grooming picture on the left, and what came out during the grooming on the right. The undercoat nearly covered my 3’ x 2’ table. This dog had not been groomed in at least a year, though his owner had bathed him regularly. Unfortunately he had not been brushed, so I ended up giving him a “smoothie”, a euphemism for what groomers call a “strip” or shave. As you can see, the coat is literally wrapped around the leg. These dogs were victims of“breeding programs” at labradoodle kennels here in California. They had been bred many, many times before they found their forever homes. As you can see, we would have to let parts of Coco, (left), grow out to help her final clip hide the effects of over breeding. This puppy took about 2 1/2 hours to correct the “grooming” that had been provided by the breeder. She had been quickly brushed on the top of her coat, not to the skin. The matts had been cut out with scissors. Her feet and face hadn’t even been completely shaved. It was probably the first time she had been worked on even to that extent. We ended up letting the uneven parts on her body grow out, as the owners wanted her fluffy for Christmas. Needless to say, she was probably traumatized by one or more of the events, and I am only now weaning her off the tranquilizer that has been necessary for her groomings. It’s been 3 years, and she is making progress. She is such a sweet little girl! This is how she turned out. Though I took my time with her, she was still stressed. As you can see, she is panting, though it was a cool evening by the time we were finished. I have adjusted her clip to reduce the grooming time, and avoid the processes that cause her anxiety. This is an example of extreme matting. The coat came off in almost one piece, and as you can see looks like a rug. It hangs on its own from my grooming arm. The white flakes you see in the photo to the right are caused by a build up of skin oils and lack of air circulation. These were both elderly dogs whose owners either did not know, or could not get them groomed regularly. Both of them required many hours of careful shaving with several blades to keep from injuring them. The Scottie had never been groomed regularly, and as they tend to be, he was, let’s say nippy. 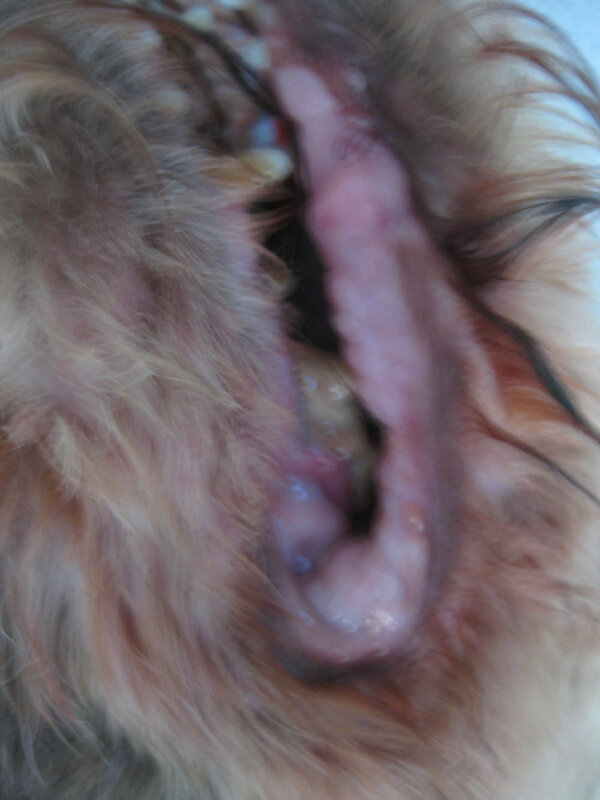 Shaving a dog while avoiding it’s teeth is no fun! 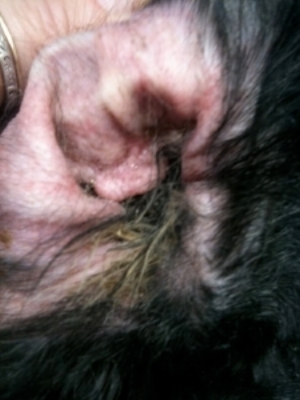 This ear looks pretty good, though it needs cleaning. The first step would be to pluck the hair out. It’s nearly impossible to properly clean an ear blocked with so much hair. It’s long enough to clip!